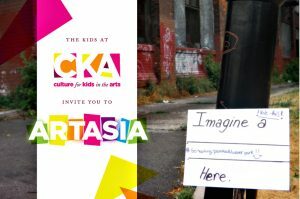 ARTASIA is a Culture for Kids in the Arts city-wide arts and environmental project aiming to release the voices of children into the community and developing their capacity to see potential. Reaching 500 school-aged children, at 14 locations around the city, this year we focused on the theme of neighbourhood development. Come to the Hamilton Conservatory for the Arts to see 84 mixed media photographs of Hamilton neighbourhoods on exhibition. Culture for Kids in the Arts (CKA) is a registered charitable organization dedicated to providing high quality arts experiences to children and youth, regardless of their financial circumstances. CKA programming encourages students to expand their learning potential through their natural enjoyment of the performing and visual arts.